4 million lights drape the park in holiday splendor, casting a warm glow that sets the scene for a winter wonderland like no other. Create a family tradition at Dollywood's sensational shows, including the triumphant return of perennial favorite Christmas in the Smokies. Let the heartwarming sounds of the season set the stage for a Christmas the entire family will enjoy. Don't miss Santa's Workshop, where larger-than-life-sized toys and an 18-foot-tall Christmas tree fill guests of all ages with wide-eyed wonder as they discover a giant wagon, sailboat, dollhouse and more amid the hustle and bustle as Santa and his helpers ready for their big night! Santa's also the star of the Parade of Lights, along with a cast of brightly lit floats and colorful characters. 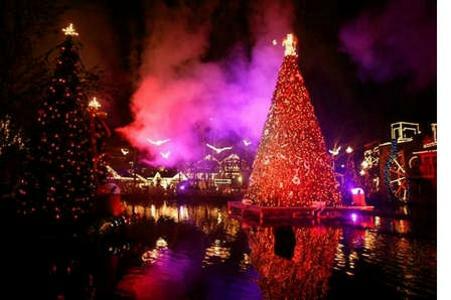 The entire list of programs and additional information is available Dollywood Smoky Mountain Christmas website .